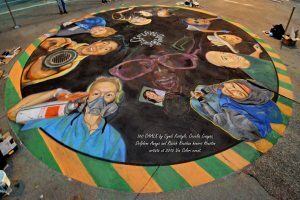 We are proud to bring chalk art by talented street painters to ArtWalk Carlsbad. Chalk artists will create their masterpieces on the asphalt before your eyes during the two-day event. The tradition of street painting comes from the ancient art of the “Maddonari” in Italy who created chalk art in front of the churches and cathedrals…and this spectacular art form thrives today in chalk festivals around the world. Schools and youth groups are encouraged to participate. ArtWalk Carlsbad celebrates this time honored tradition September 21 & 22. If you’re a chalk artist and wish to apply, click on this link.